“The rich potentials and resources of the state which remained hitherto latent and untapped will henceforth be put to optimum utilisation to benefit the people of Arunachal Pradesh” said Chief Minister Pema Khandu. 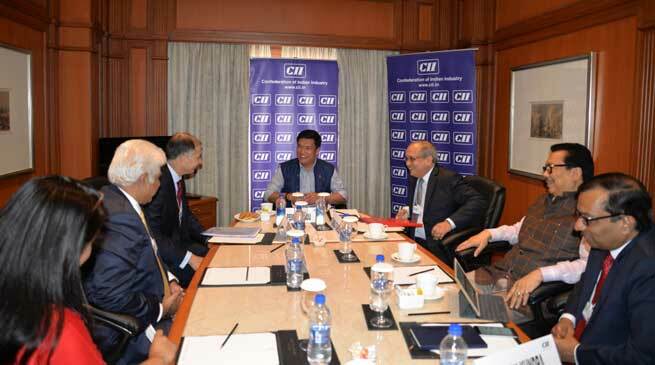 He said this after inking a historic MoU between Government of Arunachal Pradesh and Confederation of Indian Industry (CII) to promote and project Arunachal as the preferred investment destination, to attract investments and build capacities within the State. The MoU was signed between the State Govt and CII at Hotel Taj today in presence of Naushad Forbes, from Forbes Marshall and the president of CII, Deputy CM Chowna Mein, Chief Secretary Shakuntala D Gamlin, Commissioner Investment Ashish Kundra and corporate giants like Pawan Goenka of Mahindras, Ajit Gulabchand of HCC, Rakesh Bharti Mittal of Bharti Retails, Chandrajit Banerjee – CII and Banmali Agarwala (President and CEO) – GE South Asia. The mutually agreed sectors where CII shall support the state government are HydroPower, Skilling, Tourism, Horticulture/floriculture, Agro-processing, and Information Technology. It was agreed upon to constitute a high level Joint Task Force for successful implementation of the initiatives. A detail development plan would be worked out by this team for Arunachal Pradesh in a time bound manner. CM Khandu had been aggressive on marketing the potential and resources strength of the state. “Our state is one of the most peaceful state in the country having rich deposits of untapped resources like, tourism, Hydropower, Agro-Horti etc.” he informed while saying that if given the right platform, Arunachal has the ability and capacity to become a front runner. “We are a developing state and we are in a position to tailor make policies to suit the industry leaders” CM emphatically said. He even disclosed that he would request the Union Government to make investment friendly policy for Arunachal to make business competitive in the State. Pawan Goenka of Mahindra expressed interest of constructing resorts in the state and shared that his company would soon send a state champion to Arunachal for studying the possibilities. Rakesh Bharti Mittal of Bharti Retails showed interest on floriculture, Agri and Allied sector of the state. Similar interests were shown by business icons on Hydro Power sector. In his closing remarks CM said “Arunachal Pradesh is known as the land of rising sun. But after this historic agreement, I am confident that our state would soon see the sun of investments”.